"Ultimate Combat Skills - Personified 武的化身 (wǔ dè huà shēn)"
Quite possibly the best fighter in all of China in that era, Lu Bu was a formidable general that struck fear in his opponents. Yet for all his military prowess and combat ability, Lu Bu was not the smartest of people. Throw in a tinge of greed, a sprinkle of lust, and you have a riding, fighting disaster atop four hooves. Dong Zhuo 董卓 found that out the hard way. To win Lu Bu's favour, Dong Zhuo showered Lu Bu with expensive gifts such as the Red Hare 赤兔 horse and an assortment of jewels. Lu Bu came under Dong Zhuo's wing after all receiving all those goodies, then ended up murdering Dong Zhuo victim over a woman. After Dong Zhuo's death, Lu Bu became a minor warlord and led a series of battles in an effort to expand his territory. However his poor use of strategy and refusal to listen to advice ultimately caused his downfall. After selecting a player as the target of your ATTACK 杀, the target of your ATTACK need to use two DODGE 闪 successively to neutralize your ATTACK. During a DUEL 决斗, your opponent needs to play two ATTACKS successively each time. Lu Bu has 2.5 units of maximum health instead of 2, differentiating him from other characters with 4 units of maximum health in normal SGS. Another character with this additional health is Guan Yu 关羽. Some joke that they eat their horse, RED HARE 赤兔, to gain an addition 0.5 units of maximum health. The description of “Without Equal” is slightly changed to clarify the timing of activation. In general, Lu Bu is unchanged from the original SGS. "His courage and bravery, unsurmountable. His eagerness for battle, unprecedented. Yet brave but without cunning. Violent but without benevolence. 骁勇无敌, 善战无前. 然勇而无谋, 暴而少仁." 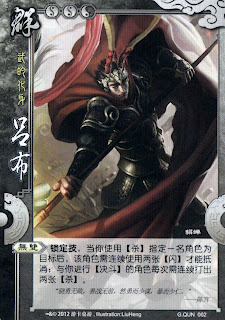 无双 literal translates to "Without Equal" and refers to his incredibly combat skills. Thankfully, it does not seem to be sarcastic referring to his intellect as well.